Over the past years I have been producing photographic artworks focused on concepts of space and time and their relationship to larger cultural narratives. As part of that undertaking I have developed a curiosity centered on how we perceive, represent and discuss our surroundings. Producing a series of spacetime artworks has been tantamount to that inquiry. Our experience of space and time appears to be shaped as much by innate abilities, intrinsic to . 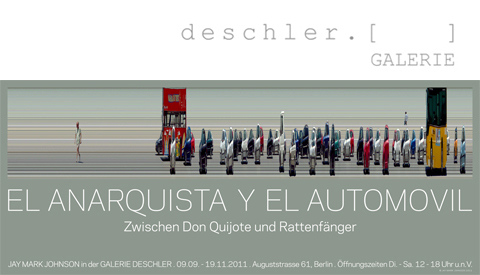 . .
GALERIE DESCHLER | EL ANARQUISTA Y EL AUTOMOVIL | 9 September – 10 December 2011 | ARTIST STATEMENT here. | POSTER here. | PRESS RELEASE here. Over the past years I have been producing photographic artworks focused on concepts of space and time and their relationship to larger cultural narratives. As part of that undertaking I have developed a curiosity centered on how we perceive, represent and discuss our surroundings. Producing a series of spacetime artworks has been tantamount to that inquiry. Our experience of space and time appears to be shaped as much by innate abilities, intrinsic to our biology, as by historic tradition. My aim is to participate in contemporary discussions on these matters. When plausible, I make an effort to apply any attendant understanding, however oblique, towards a more comprehensive and accommodating sociopolitical critique. 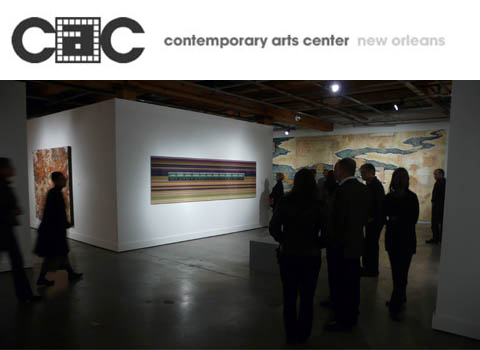 CONTEMPORARY ARTS CENTER: New Orleans | FREDERICK R. WEISMAN FOUNDATION | Elements of Nature | November 6, 2010 – February 27, 2011 | PRESS RELEASE here. 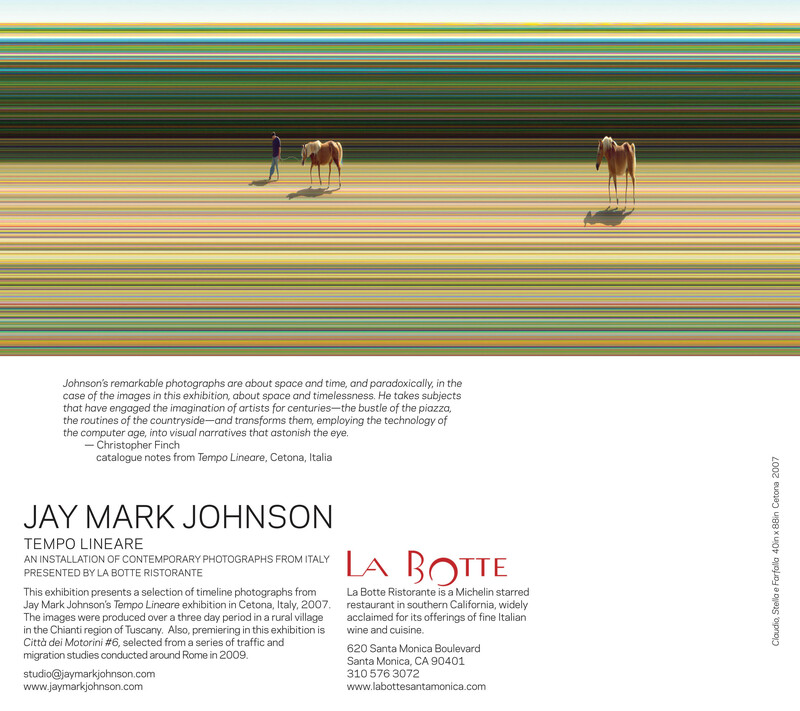 A selection of timeline photographs from Jay Mark Johnson’s Tempo Lineare exhibition in Cetona, Italy, 2007. 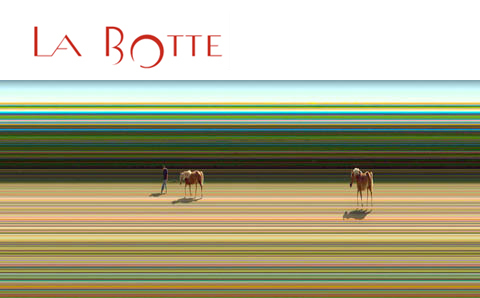 The images were produced over a three day period in a rural village in the Chianti region of Tuscany. Also, premiering in this exhibition is Città dei Motorini #6, selected from a series of traffic and migration studies conducted around Rome in 2009.
migration studies conducted around Rome in 2009. LA BOTTE RISTORANTE | Ongoing exhibition | View postcard here.